Yesterday I didn't end up outside at all because about fifteen minutes after posting that I had a window of opportunity...it rained! Ugh! But I did get ahead on my menu planning, got 17 dinners planned and worked on my shopping list for Monday. However...when I woke up this morning at 6:30am, it was actually sunny! I looked at the radar, and the rain was supposed to start around 3pm, so after a walk with the dogs, I was out. 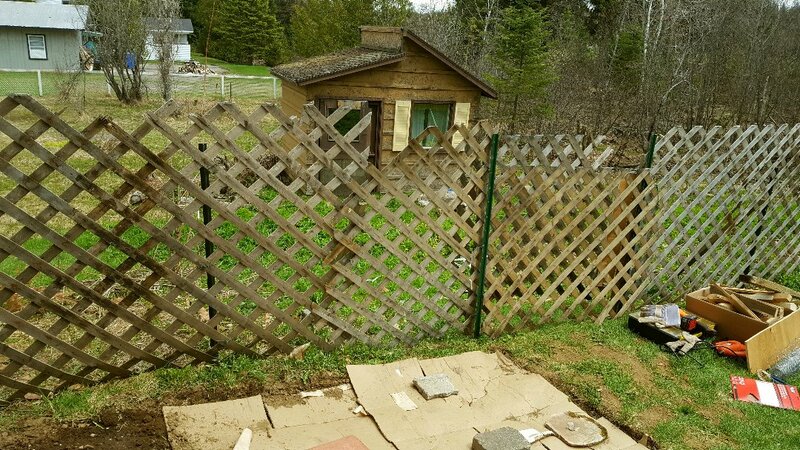 I "rebuilt" so to speak, the lattice fence we have on the side of our yard where the icky neighbours are. Despite all of our efforts, the village did NOTHING about the loose dog situation, in fact, they don't even reply to us anymore. Whatever...we aren't planting roots here...anyway, this fence was put up last fall in a hurry and on a very tiny budget, now it's secure and I even made a gate so that we can bring the lawnmower up and down without having to walk all the way around the house. This took a long time, but I'm so proud of my skills! :) And it only cost me about $25 in total to buy those green T-posts. The lattice was given to us by the lumber yard, they had scraps of it, lots damaged, but we salvaged what we could. I love making frugalness work! 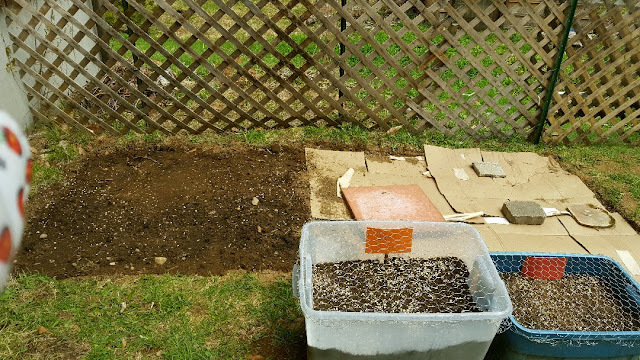 I also extended my pumpkin patch and covered my carrots and radishes with chicken wire - those Blue Jays were hovering this morning...I also started to measure, saw and sand the framing for my screened-in porch. The skies started to get dark around 2pm so I came in, stretched and re-hydrated. The Arnica gel is being tested right now! Now it's time to plop! My dear Alex is sick, and he has insomnia. He can't seem to sleep at night and was usually falling asleep at sun up...but the last few days, he can't even fall asleep at all. I am going to spend my days out in the yard and garden, and taking care of him too. I've been posting almost daily for three months now, but I can see a slow down imminent. Just wanted to mention that so nobody thinks I've disappeared! But I'll be lurking lol! I'm so excited that the warmer weather is here. It's still going to rain for a few days, but that'll give me time to plan my monthly meal plan and shopping list. But as of Tuesday, I'm in the dirt! 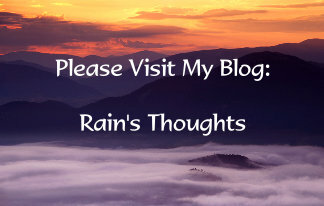 I'll probably slow down the posts to a few a week and I still need to catch up on everyone's blogs! Looks good Rain. Good Luck! (Nasty birdses. They were in my neighborhood they day I planted as well, looking for seeds to steal). Rain - we finally had a sunny, proper spring day today...and we are not afraid to admit that we are sun-shocked. holy moly it has been a long wait up for spring....tomorrow is supposed to another sunny day so we'll be up and at'em early. about time too - i still don't have anything in the ground except the garlic we planted last year. i am getting stressed about how late in the season it is but thank goodness jambaloney reminds me "everything in it's time". i am glad you got out for a bit and good work on the fencing. jambaloney and i are big believers in coming up with super cheap - oops - i mean frugal ways of getting jobs done. no worries about blogging. it's this time of year that the gardener's stop putting up blog posts because they are out in their yards. we always have lag time during gardening season because it ain\t easy being out in the yard, nekkid, or down at the river swimming. if tomorrow is as nice as they say it will be - it will be our first dip in the river and it will be FRIGIDLY COLD! we don't care - we love that river! sorry to hear about alex's insomnia acting up like that - try using dried sage until you have your own plant growing and then just put some dried sage in a cup with boiling water and see if that helps him...and you. Does Alex get any physical exercise in during the day? Sometimes I can't sleep if I haven't 'moved' enough but that is usually not a problem for me. It must be awful...what about warm milk, no lights, reading until you fall asleep? He probably has already researched it. You shouldn't eat 2 hours before bed either as then your digesting your food while you're trying to sleep. Anyway, I hope he gets better. 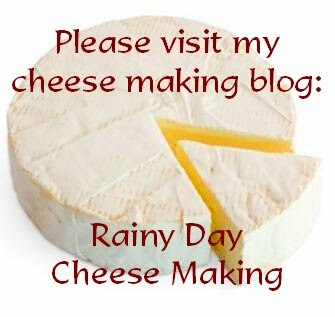 I know I have a hard time keeping up with blogs and blogging this time of year because my work load doubles with all the outside work and inside too plus trying to make everything from scratch. I totally understand! Good gardening! Seems all of us gardeners are in the same "I-need-more-time" boat!! It will settle down a bit when all is planted and growing. It takes me a full month to get our whole garden in (the raised beds and field garden), plus getting the berry patches and fruit trees ready for the growing season. Love to see your pictures and read your words of all that you're doing -- between rains, that is. Your enthusiasm is wonderful and contagious. Poor Alex! I've been waking during the night, too, usually to make a potty stop but then can't fall back asleep. Fortunately, reading makes me sleepy, but I have to go out on the couch (so glad it's big enough and comfy!) to do it as hubby is a light sleeper. At least Alex works at home so he doesn't have to drag himself out and off for the day after not sleeping at night. But I know that doesn't make for a profitable day's work at home for him either. This, too, will pass but it's a pain in the patoot when one is battling it. Hugs to both of you. A good fence like that is one of the most important things if there are lots of animals around. It is too wet to do much here. So much is happening here and I take pictures to post them but then never get around to it. I fall into my ned exhausted from doing what I love and that is most important. i planted most of my container garden today. i hope it does well this year. we are in for hot sunny weather here all week so i will spend lots of time watering. Here's me chiming in 2 days after I should have! But let's chalk it up to the warmer weather and getting outside to get stuff done!!! I don't think I sat down all weekend. I totally understand if things slow down in summer for posting...that should be the norm! I hope Alex is feeling better. I have perpetual insomnia so I totally understand how frustrating and "tiring" it is. Sending my best to him for sleep to find him and stay! Around our little patch of city land I have many, many gardens. This is what I have been busy with - cleaning, weeding, raking - making it pretty for more plants, etc. My back and my right hip are fighting with me right now. I ache all over. I need more arnica gel! Off to finish reading more posts! I think that everyone's posting starts to peter out this time of year - there is so much to do and so little time. Especially for us, with our constant rainfall! I really like that fence! I wish people were more aware of their actions and the consequences of same. BTW, when I am in my insomnia states, I take L-tryptophan. It really helps me. Maybe you could get Alex to go out on a hike with the dogs - sometimes exercise and fresh air help work out the kinks, so to speak. Hope he is feeling better soon. Can't wait to see the results of all your gardening efforts - you rock! Summer and garden usually take priority over blogging! So do sick boyfriends who need all the TLC they can get.